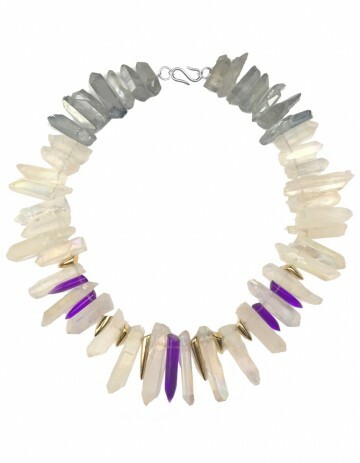 Full of fantasy this tusk necklace is made in dreamy hues. Hand crafted in our London studio, it is made up of iridescent white and light blue quartz crystals, gold plated brass and purple perspex tusks and tied with silver 'S' clasp. The total necklace length is 43cm. Due to the use of natural materials the colour and shape of the stones will vary.